Home appliances are referred to the electrical/mechanical machines which accomplish household functions such as cooling, heating, cooking, cleaning and others. Home appliances are widely used by consumers to make their everyday task easy. Nowadays, consumer prefers smart home appliances due to integration of smart technology such as wi-fi connected device which can be monitored by your phone. The Middle East home appliance market is expected to grow at robust growth over the forecast period i.e. 2017-2024. Further, the factors propelling the market of home appliance in Middle East region include rising disposable income of the population coupled with rapid urbanization. Additionally, advancement in home appliance technology is envisioned to foster the growth of Middle East home appliance market in the next few years. On the basis product type, Middle East home appliance market has been segmented into kitchen appliances, refrigeration appliances, washing appliances, room comfort, water heater appliances, cleaning appliances and entertainment appliances. Moreover, kitchen appliances and room comfort appliance are believed to be the fastest growing segment in overall Middle East home appliance market by the end of 2024. Additionally, kitchen appliances segment is expected to post the highest CAGR of 12.8% during the forecast period. 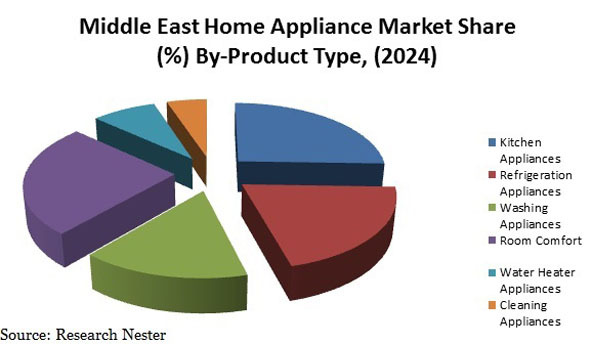 Furthermore, the Middle East home appliance market has been segmented in terms of countries such as United Arab Emirates (U.A.E), Saudi Arabia, Israel, Qatar, Oman, Kuwait and rest of Middle East. United Arab Emirates (U.A.E.) accounted the largest market of home appliance in terms of revenue in 2016. Moreover, U.A.E. is expected to continue its dominance by the end of 2024 owing to heavy adoption of energy efficient home appliance. Moreover, growing population coupled to changing lifestyle is predicted to fuel to the growth of home appliance market in United Arab Emirates (U.A.E.). 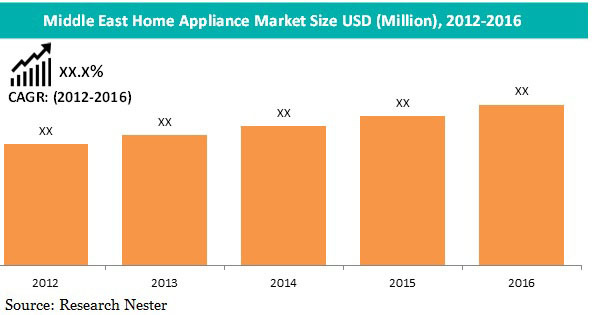 Factors such as growing demand for next generation home appliance integrated with technology such as wi-fi, bluetooth and others are believed to be the dynamic factor behind the rapid growth of home appliance market in Middle East. Further, rapid growth towards energy efficient home appliance products along with technological advancement in kitchen appliances such as microwaves and others are anticipated to flourish the growth of home appliance market over the forecast period. Furthermore, growing population and rapid infrastructure development are also projected to elevate the growth of home appliance market. Additionally, rise in per capita income coupled with rapid urbanization and penetration of online stores are presumed to foster the growth of home appliance market over the next few years. Likely, growing popularity of next generation home appliance is also projected to flourish the growth of home appliance market. However, high cost associated with home appliances is expected to hinder the growth of home appliance market during the forecast period.